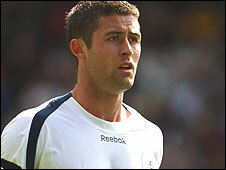 Defender Gary Cahill has signed a new three-year contract with Bolton that is set to keep him at the club until 2012. The 23-year-old joined the Trotters from Aston Villa for £5m in 2008 and was called up by England in June after impressive performances last season. "Gary is the best young centre-half in the country by an absolute mile," said Bolton manager Gary Megson. "He's had another great season - it's only a matter of time before he plays for England on a regular basis." The Sheffield-born player signed for Villa's academy at the age of 15. How highly do you rate Cahill? He spent part of the 2004/2005 season on loan at Burnley before making his first start for Villa in the derby against West Bromwich Albion in April 2006. Cahill spent another period out on loan in 2007/08, this time at Sheffield United.